I live in the Eastern Cape of South Africa. I'm home schooled. Most of my time is taken up doing chores around the house, helping my Parents, studying, caring for the pets etc. I also do a bit of cooking, baking and sewing, more the first two. I'm also a part time secretary. Most often my free time is generally taken up here on Fishlore or reading, which is my main hobby. I read mostly fiction, like mystery, adventure and spy books. Nonfiction is generally animal related or DIY. I like to just watch animals, love the outdoors stuff, like hiking and a bit of sports. I also take interest in RC helicopters and planes as well as airplane models. You'd think that with the amount of birds and fish I have one of them would be my favorite animal but no, horses are. Ever since I was a kid I have always loved animals. My first pet was a dog. My parents had one when I was a baby, since then we have kept different pets on and off. When I was younger I had many cats as pets. My last one was a siamese cat, named Sultan. I had him for a few years but unfortunately he was run over by a car. It was hard for me to come to terms with the loss, so my parents decided to take a break in keeping pets until we were old enough to understand the responsibility. Our first tank came when I was a kid too. It was something like 60-70 gallons. Filling it up was messy business, the hose pipe came into the lounge, water splashed everywhere. Then we got lots of koi from someone my Dad knew. For a few days all went well and we were very excited by it all. However perhaps partially due to the tank being second hand and partially due to some unknown reason it started leaking! I'm afraid that was the end of fish keeping for then. It caused an even bigger mess! 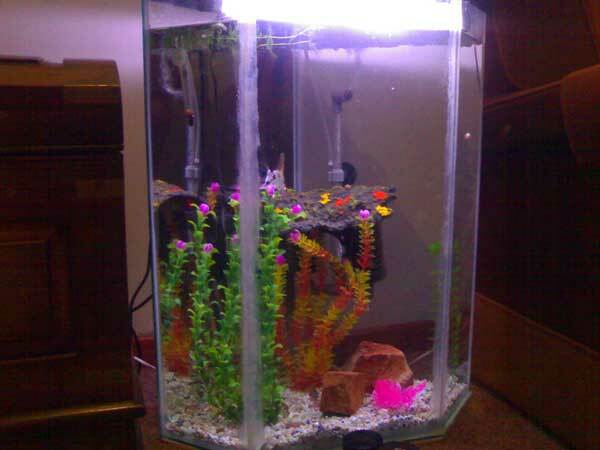 My Mom had been against the tank before it came and after it started leaking she said 'no more fish tanks'. So that was an end to fish keeping - for then. About eight years ago I was given a parakeet. It was a young blue ringneck, which was 'supposed' to be a male, but had turned out to be a female. I named her Chirpy. I had her until last year. Having kept her in an aviary in the last few years, Chirpy as well as other ringnecks I had in there made a hole in the mesh and flew away. That was the beginning in bird keeping. A hand reared lovebird followed and since then we've kept lovebirds, cockatiels, finches and other parakeets. Some still find themselves here while other passed on. At present I have a breeding pair of cockatiels, 3 Indian ringnecks, two green and one blue. Then others which are owned by the other members of the family as well, are 2 lovebirds named Butterfly and Peachy - two males there, we have to see about swapping one for a female. A brown eared conure named Odie. And an African gray named Rafiki. Rusty and Tiger, our dogs, end the lot of our animals. 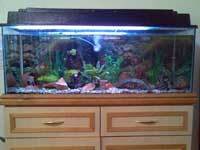 This session of fish keeping started about 7 years ago when my Mom's friend gave me a small (5 gallon) fish tank. The tank upgraded into a 30 gallon and thereafter into my current 67 gallon. I kept goldfish in the 5 gallon and quickly grew bored of them. My Dad then got me the 30 gallon tank, secondhand. I kept tropical fish in there. I can't say it was a success. Many fish died as I wasn't looking after them correctly. Needless to say I thought I knew what I was doing and blamed the fact that those fish were bad quality, sick fish, whatever. Then the 67 gallon came in. Wanting bigger fish I went for malawi cichlids. That decision nearly finished my fish keeping interest forever. 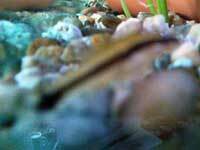 I hardly knew about cichlid aggression, even less about African cichlids. It was a disaster. Whenever me, or my family looked at the tank, instead of seeing a peaceful scene, we saw one fish chasing another, a fish hanging on the top, or one's fins getting ripped. Horrors! I had them for 9 months and then just couldn't take it anymore. I gave them in and hardly got their worth. That added to the blow as Malawi's are by no means cheap. I was all for giving up tropical fish then and was considering keeping koi in the tank. 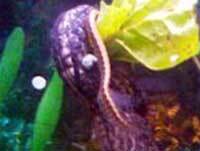 While I had the Malawi's, I wanted an algae eater to clean the algae. I was told that the Malawi's would do the job but since they didn't, I thought a BIG algae eater will do it because it was a big tank. Haha. 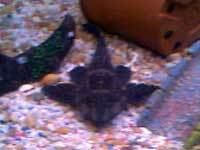 I got my common pleco, Algy, who I still have today in the pond. This was December 2006. 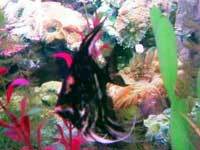 By January 2007, going to a pet store (which is my lfs, today) 'just to have a look at the fish' I bought 2 red tail sharks, a gourami and some other fish, I can't remember now. That was the start to tropical again. The red tail sharks died pretty soon after I bought them. 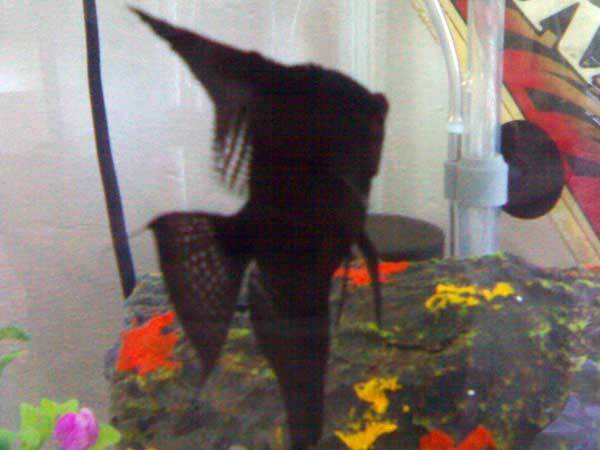 In April having a problem with my gourami, I found Fishlore. 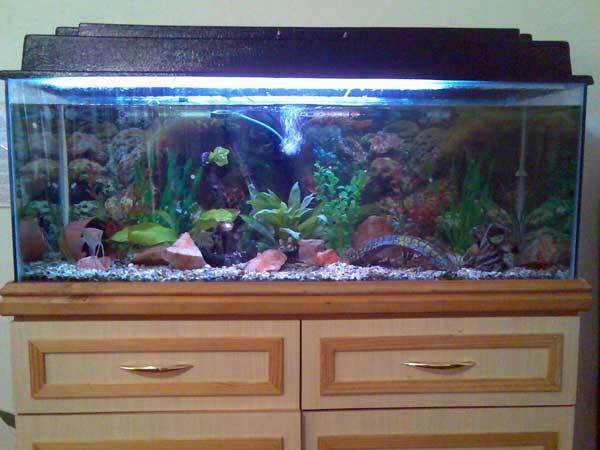 A 67 gallon / 260 liter - Community aquarium. A 24 gallon / 90 liter - Tall tank, I intend to breed angels in here. An 8 gallon / 30 liter - which is in the process of being repaired. Currently stocked with 64 inch of fish. The first is a community aquarium. Plants and rocks are my main objects of decoration. There are quite a few live plants in here at the moment but I would like to stock up with a good lot more in the future. However, for a while it will have to stay as is until I can supply the capital which is needed. The plastic plants add color to the aquarium as well as the rocks. A bridge, which my pleco's love, an anchor, tree trunk and an over turned plant pot go for other decorations. What I want to put in this tank also, is a long piece of bogwood twisted in among the plants. I have 60 watts of lighting which I keep on between 7 and 9 hours a day, an internal power filter and a heater, not sure on the sizes. I'm stocked nearly to capacity in the all the fish, besides the mystery pleco, in adult size. However all water readings are in order. Perhaps what helps keeping the water readings in order is the amount of plants and the fact that most of the fish are supposed to be low wasters, at least to the best of my knowledge. So long as it stays in order I'll be happy. I do between 10% and 15% water changes every week in this tank. The angels are having it out at the moment. They've been fighting for a while now and I can't wait for them to pair. My personal wish is for Fire-Head (Black marble) and Silver (Silver zebra) to pair up, but time will tell what it is to be, I guess. Soon as they pair, the pair comes out of this tank. The remaining one I might keep or trade it in, depending on who it is. However if the fighting carries on much longer I'm going to have to return one before a dead one comes up, and I think I may return the black. The harlequins have schooled and seem to be happy enough as is, although, I know, I'm one short. I've tried many times to add more but they either get whacked by the other harlequins or get eaten by the angels. These 4 seem to be able to get on with one another AND live with the angels. The black tetras have schooled too. I was contemplating getting two more but I saw adults at my lfs and they were rather on the large side. So I'm not too sure. The cherry barbs I'm definitely going to get more as soon as possible. I got that one as it was the only one at my local fish store. I think in schooling fish, harlequins and cherry barbs come out on top! Nothing much to say about my Queen arabesque pleco. About two and a half inch in size, and slowly but surely, getting less shy. He comes out in a hurry whenever there's food around though! All day he sits in a position on the anchor so that he can watch what's going on around him, or else hides behind it. About the mystery pleco's, I've 3 small ones, under 2 inches. I only had them for a few days now. From the little time I had to know them, they seem to be very lively and sucking all over the glass and decor, looks like they want the tank spotless! Do I dare hope they are sucking algae? lol! I can't say they are really shy, but any sudden movement sends them scooting off! Kuhlis? Did I say I have kuhli loaches? Sorry, I meant my invisible scavengers! All I see of them is their peeping faces from under something or the other. As for the eel, now there's an interesting little chap. Always nosing around with that longish snout or swimming against the glass. If he's missing for a day or two, you must know he's burrowed under the gravel. Currently stocked with 22 inches of fish. In this tank I only have plastic plants and rocks. Later on I hope to add one or two live plants. nitrates: 0, nitrates: 10, pH: 7.5. I do 15% water changes every week. Equipment wise, I have a sponge filter, 100 watt heater and an air pump. 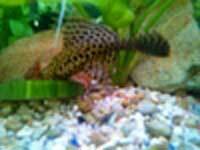 My leopard sailfin pleco is one of the boldest pleco I have seen. Never afraid of light or humans, he's out in the open 80% of the time. 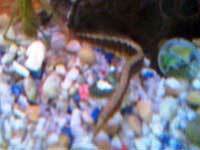 A great greedy guzzler he is too, eating any type of food I put into the tank. However I can't keep him in this tank forever as if he reaches his adult size he will grow to 50 cm! Hopefully he does grow to that size! I intend to put him in the pond along with my common pleco, Algy, when he gets too big for this tank. Oh, and his name is Mr. Rockafella. Lol, my Aunt named him but I dunno how the name stuck! The angelfish and gourami in this tank I intend to return to my LFS soon, as in this tank I intend to put my angel pair. It's under the recommended size for angels, so for the future here I hope to update this tank to a slightly bigger one. I'm afraid this tank was cracked accidently. I must just get into the mood to repair it, hopefully soon! These are the ideas I had for this tank. A pair of bettas, brackish swamp or just keeping it as a hospital tank. I haven't made up my mind yet. A salt water tank. At the moment I'm doing research on the equipment needed. I think, a 20 gallon with a FOWLR setup is what I'd like. However I'm still not 100% sure I am going to get into it. But if I do, perhaps by March or April I should be setting the tank up. First Thanks go to my Parents. If it wasn't for their understanding I wouldn't be keeping fish today. Fishlore brought me to where I stand with fish today. Many Thanks go to all the members who taught me, even if it is a little something. Some of them include, Carol (Butterfly), Dave (COBettaCouple), Dino, Laure Anne (Armadillo), Tom, Kate (Capekate), Agsansoo (Andy), Atmachine (Austin) and of course Mike, especially for this forum. I have to say that 2 of my local fish stores taught me the first few basic things about fish keeping. Pet boutique (Aquatic) and Ultimate Aquatics.